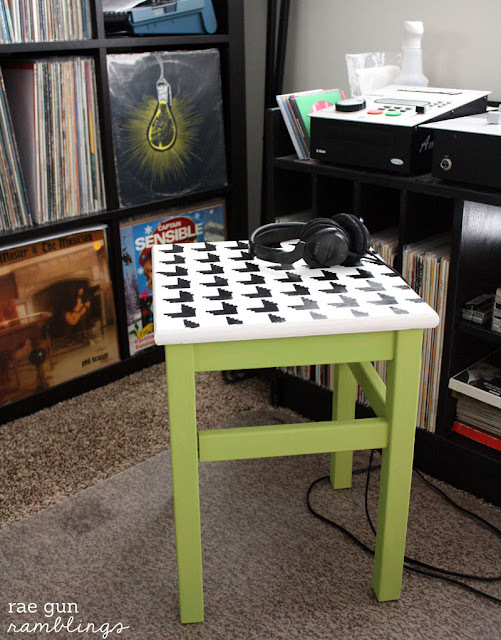 I’ve had these inexpensive Ikea stools for ages. I use them for absolutely everything. They hold my dinner most nights, serve as extra seating, a place to rest my legs while blogging and so much more. The only problem is that they were kind of trashed. Kid marks, spilled drinks, you name it stains of all kinds have sunk into the unfinished wood. So, I decided it was time to give them a little makeover. I actually used chalkboard paint since I thought that would be fun for the nieces and I’m totally in love with how they turned out. 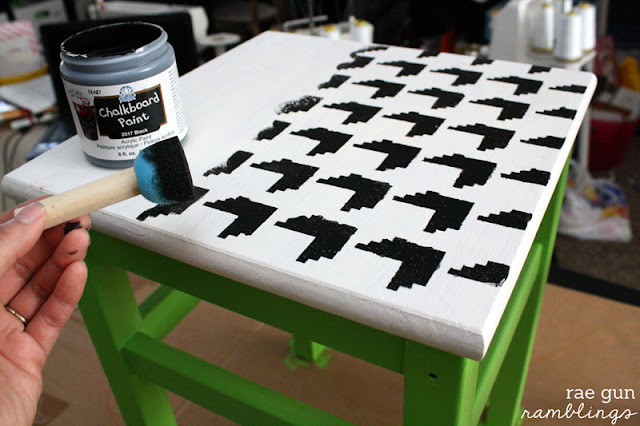 I used a houndstooth FolkArt stencils with a mix of acrylic and chalkboard paints. 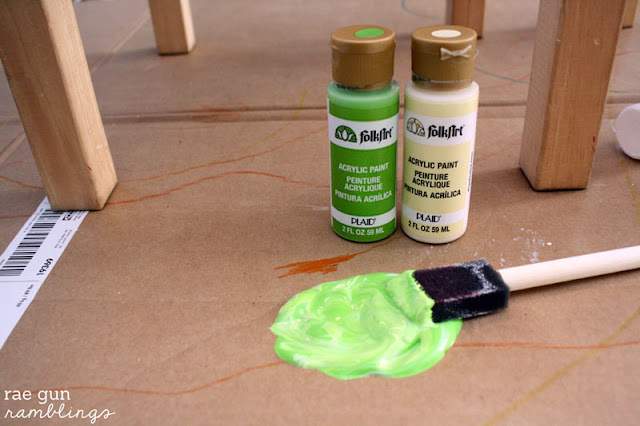 I started off by painting the stool with Folk Art acrylic paint. I mixed a few colors that I had on hand to a color similar to the green in my fabric covered boxes. After the white coat dried I taped the stencil in place and using a stencil brush I applied the chalkboard paint. It’s probably better to let it sit there and dry but I’m so impatient I lifted the stencil off super quickly and washed off the paint. Then after the pain was dry (about 30 minutes) I moved on to the next section. It definitely had a learning curve but after I got the hang of it it wasn’t too bad. The edges aren’t perfect but I kind of like the imperfection of it. I thought about trying some spray adhesive but I wasn’t sure if there would be residue left on the bench. Hope you like my houndstooth stool makeover! 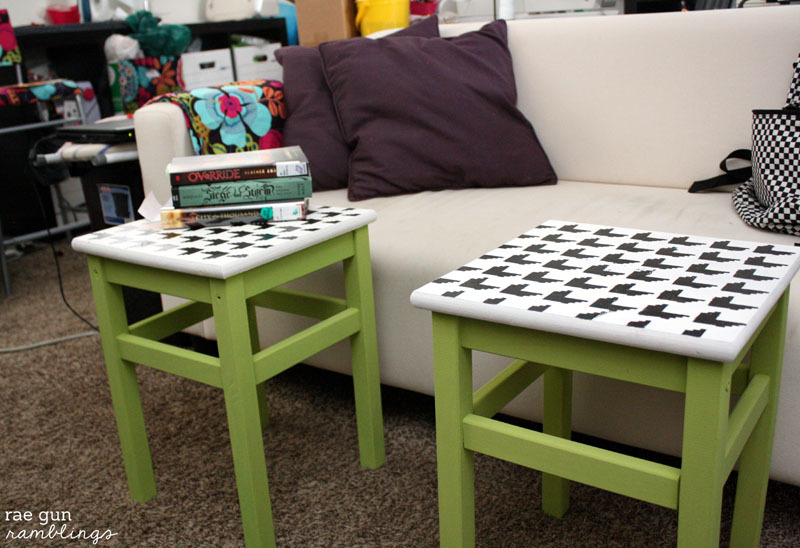 I love the Houndstooth with the bright green!Cute idea! 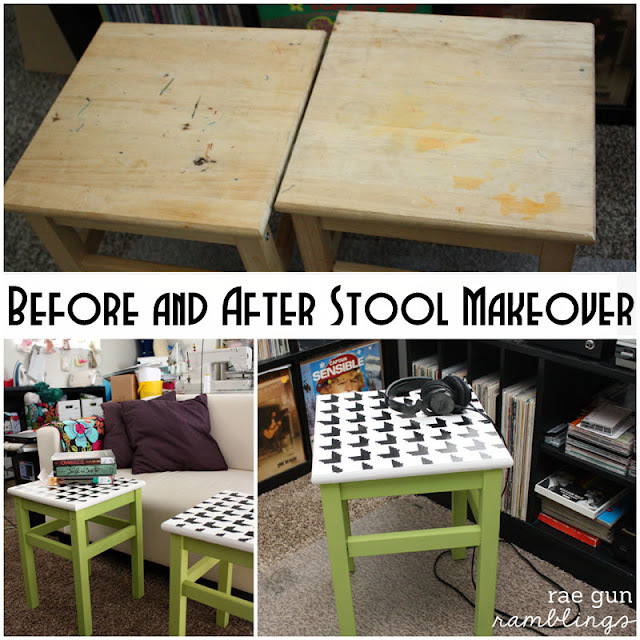 Great makeover – I love the green and houndstooth – so cute! SO cute! I love the bright color and pattern. Love it! It turned out soo cute :)! I love the color combination too! Love the Houndstooth with the green. Looks great. Super cute! I too love the green! I love that bold black-and-white houndstooth graphic print with the bright in-your-face green! Looks like a fast and fun, rewarding project! So cute! I love the green with the houndstooth! I absolutely love this. Love everything about it. I am hosting a link party and would love it if you would share this. Absolutely adorable!!!! Visiting from Snap Link Party…. I love how this turned out Marissa! Very cute! I hopped over from Diana Rambles. I own two of these stools as well… they are just boring white right now. Perhaps it is time for a change:) Thanks for sharing! Cute and kind of French! Looks great!! Thanks for sharing at Romance on a dime!! wow! that is an amazing idea and that stool is looking so beautiful. i really like it and will try it at my home. This is nice stools and photos so beautiful,Nice describe thanks for share it. Wow! it’s Great post thanks for share it. This stool was very gud i will definitely try to make this.